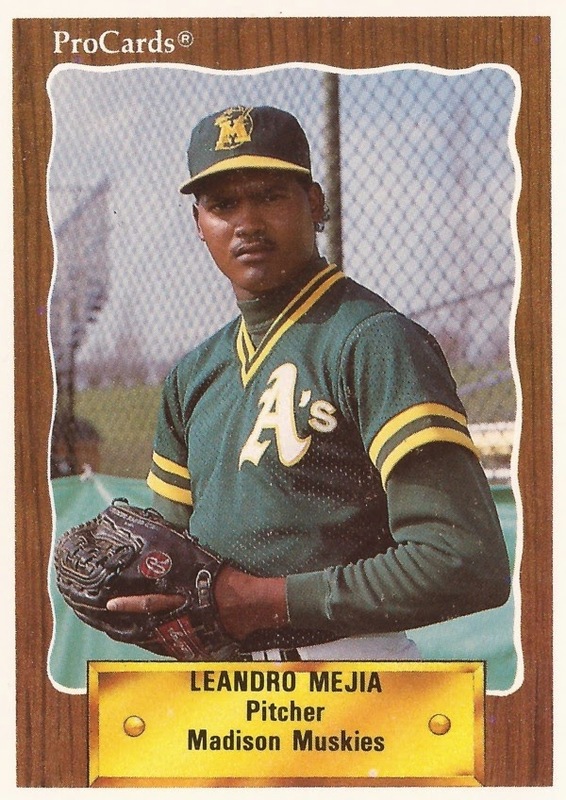 It was just one complete game, but it got Leandro Mejia on his team's leader board in 1991. Mejia's complete game came with the single-A Madison Muskies. He was one of four Muskies to go the full nine that year. No one on the team got a second one. The Mejia complete game came in his fourth professional season. It was his first complete game in that time. It was also his last. That season with Madison turned out to be his final season as a pro. He never made AA. Mejia's career began in 1988, signed by the Athletics as a free agent out of his native Dominican Republic. Mejia first hit the field in the rookie Arizona League. He got into a single game, a single inning. He gave up one hit and no runs. He returned to the Arizona League for 1989. He got into 14 games this time, starting nine. He picked up five wins and a 4.93 ERA. For 1990, Mejia arrived at single-A Madison. In 20 outings, five starts, he had six wins and a 1.92 ERA. It was Madison again for 1991. He got 10 outings, nine starts. He ended with that one complete game, two wins and a 4.04 ERA. It was his final season as a pro.